Sunday marked the second and final day of this year’s Postgraduate Teaching Programme (PGT), which provided gastroenterologists with insightful updates on the latest developments in all GI and hepatology topics. With a strong focus on relevance to clinical day-to-day practice, the programme provided a perfect mix for gastroenterologists in training and in practice, as well as for established GI physicians and general practitioners. The programme included interactive session formats, such as tricky clinical cases, controversial debates and exciting video cases. This year is the second out of the 3-year PGT Curriculum, which enables participants to get perfectly prepared for their professional career. Delegates can start the curriculum at any year of the 3-year cycle and will receive a certificate once they have attended each of the 3 years. 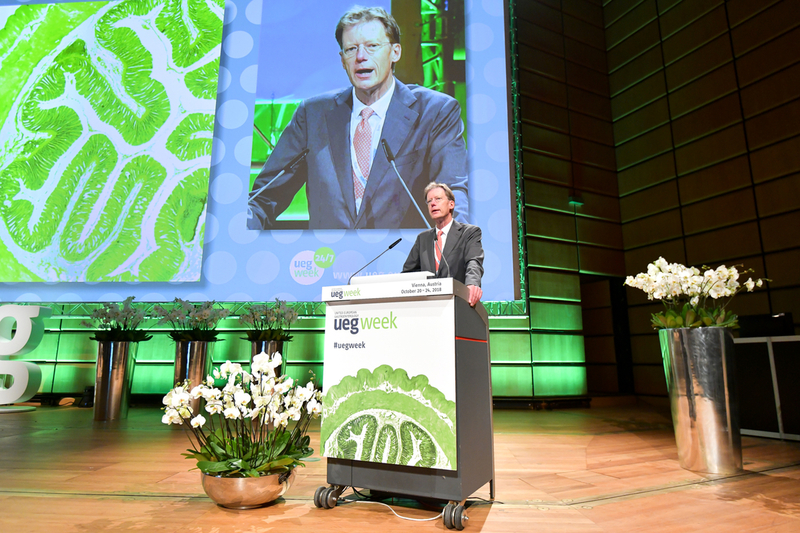 To commence UEG Week Vienna 2018 and kick start the PGT, Paul Fockens, UEG President, welcomed post-graduate delegates to the congress. “This year’s PGT programme will see the attendance of over 3,200 delegates, marking an absolute record for the programme”, he explained. 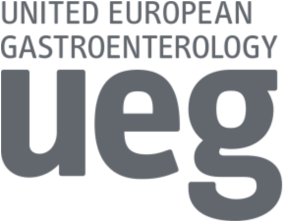 The content of the PGT Curriculum is carefully pieced together by a specialist PGT Programme Taskforce, comprising of members of the Scientific Committee. 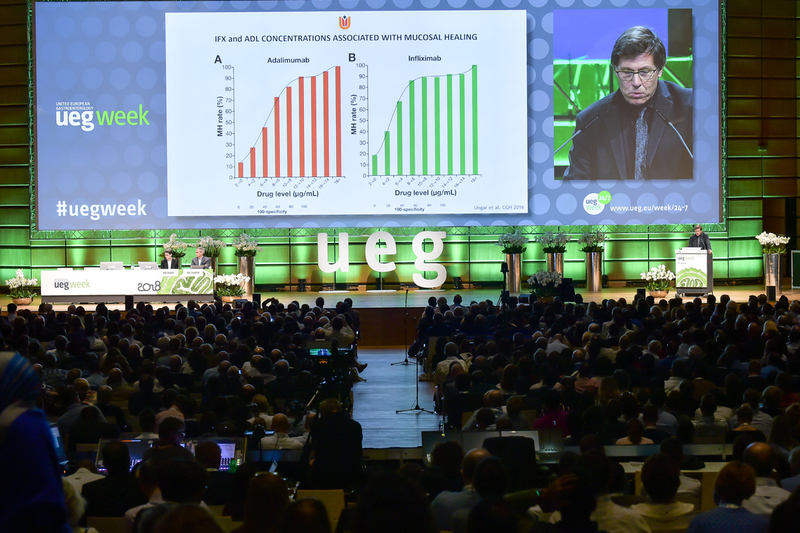 The objectives of this session were to recgonise alternative conditions that may mimic ulcerative colitis, to establish prompt and adequate medical therapy and to optimize outcomes through achieving a multidisciplinary approach. 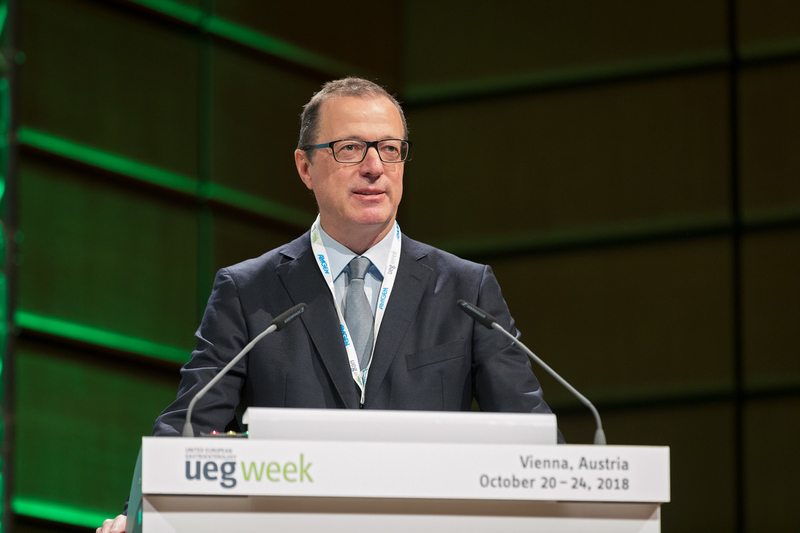 To commence the session, Marc Ferrante discussed the initial assessment of acute severe ulcerative colitis, commenting on the significance of measuring disease severity in order to help guide future management. In addition, delegates were also advised to exclude alternative and comorbid conditions, which can be achieved through checking a patient’s travel history and studying the patient’s blood count, kidney function, liver tests, C-reactive protein or erythrocyte sedimentation rate. An evaluation of the colon with flexible sigmoidoscopy to confirm the presence, severity and minimal extent of inflammation was also recommended, as well as obtaining biopsies to exclude the presence of an infection. Following a tandem talk on the medical management of steroid failure and a presentation on treating patients with toxic megacolon, André D’Hoore concluded this IBD session by discussing surgery in ulcerative colitis patients, opening his presentation by declaring that we should not accept any mortality in the disease. He commented that most acute severe ulcerative colitis patients do not suddenly deteriorate, but physicians often suddenly find issues in an emergency setting. To conclude his talk, he emphasized the importance of treating these deteriorations before reaching an emergency setting, advising that age is a significant risk factor to consider and that surgery is a key part of treating ulcerative colitis, providing a favourable option if medication doesn’t work. 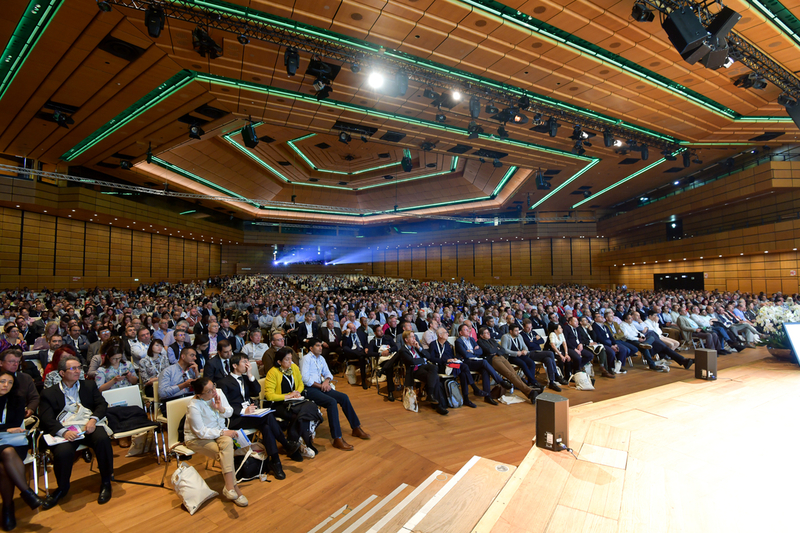 Following a case presentation, Evelien Dekker discussed how to ensure optimal diagnosis on colorectal lesions and advised how to recognize the different familial polyposis syndromes. Evelien commented on the importance of acknowledging the fact that a lot of patients will be at a higher risk of cancers, meaning that it is crucial for colonoscopies to be carried out accurately, with early diagnosis being of the upmost importance. To conclude, Evelien urged delegates to be wary of situations where more than one polyp is found as this can raise suspicion of a specific polyposis syndrome. Monica Ferlitsch closed this clinical-based session with a discussion on optimal treatment strategies for colonic polyps and surveillance intervals. She explained that for pedunculated polyps with a head of >20mm or a stalk >10mm, mechanical hemostasis should be implemented and that diminutive and small polyps are best resected with cold snare. In addition, she advised that en bloc resection is crucial for polyps carrying features of suspected superficial submucosal invasion and her main take-home message was to always ask whether you are the right doctor for this polyp. One of Sunday’s final sessions saw a discussion on the different management options we have in order to treat IBS in 2018. Brian Lacy and Fermin Mearin began the session with a debate on the diagnostic approach of IBS. Lacy claimed that a positive diagnosis of IBS was important as it improves patient satisfaction and quality of care while Mearin argued for the importance of IBS as an exclusion diagnosis. A positive diagnosis could prolong a patient’s diagnosis of other diseases with similar symptoms, such as coeliac disease, and may therefore lead to patient uncertainty, explained Mearin. Brjànn Ljotssón then discussed how psychological treatment may be an option for patients with chronic IBS and touched upon hypnotherapy, cognitive behavioural therapy (CBT) and exposure-based CBT as treatment alternatives to the usual clinical and pharmacological options. Psychological methods teach the patients how to identify and manage their guts and stressful situations through different techniques. Exposure-based CBT is for example where patients purposely trigger symptoms in order to learn how to reduce their fear of them. A highly discussed topic within the treatment of IBS is the use of probiotics. Here, Heidi Staudacher discussed these in detail, as well as dietary interventions which can be used to relieve IBS symptoms. Fibre supplementation and a low FODMAP diet were two of her dietary suggestions and, for probiotics, Staudacher explained that more research was needed, but that so far multistrain probiotics look to be the most promising. 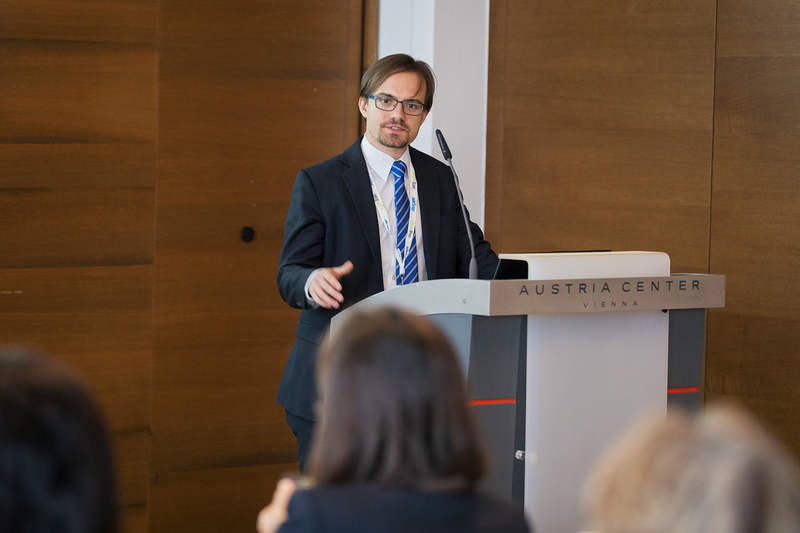 The session was concluded by Lukas Van Oudenhove and Jan Tack as they debated centrally acting vs peripherally acting medications, and which option is the logical pharmacological choice for IBS. Tack put forward a case for the excellent safety profiles of peripherally medications and Van Oudenhove for psychiatric co-morbidity in centrally acting medications. We look forward to welcoming delegates to the start of the Scientific Programme tomorrow! Catch up on the first day of the Scientific Programme! Catch up on Tuesday's action!